The bullet-riddled windshield of a car in which Timothy Russell and Malissa Williams were riding when Cleveland police officers opened fire with 137 bullets Nov. 29, 2012. The numbers: 137 rounds; 49 shots from one gun; two unarmed black victims dead. And what was the perceived threat that Officer Brelo felt when he fired through the windshield after 100 bullets had already pierced their car? The skin color of the two suspects? Their blackness? 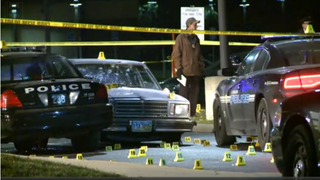 The facts of the case revealed that Timothy Russell and Malissa Williams’ car backfired before they led police on a 22-mile chase in November of 2012 that ultimately ended in the parking lot of a school where 13 officers, Brelo being one of them, opened fire on the car. Brelo exited his police vehicle, began firing, then climbed on the hood of the car with Russell and Williams inside and fired downward into the car’s windshield at least 15 times. In the end, there were over 137 shots fired by the police, 49 by Brelo, and not a single round was returned by either Russell or Williams. No guns were ever found in their car. There are a number of things that come to mind when one is attempting to process this verdict: the backdrop of Cleveland as a racially polarized city where many from our community are still waiting for charges to be brought against the officers who shot and killed 12-year-old Tamir Rice in 2014. Or the fact that in the Brelo trial, two officers were granted immunity, while other officers refused to testify against Brelo, despite the prosecution’s assurances that they were not looking to charge additional individuals. Or the fact that the verdict was deliberately released on the Saturday of a holiday weekend because court officials were aware of the incendiary nature of the announcement and sought minimal disruption to the city. But it is the judge’s assertion of a “perceived threat” against the officers that stands out. O’Donnell based his ruling on the notion that Brelo’s actions were consistent with a reasonable police officer in Brelo’s position believing that the initial backfiring of the suspects’ car was gunfire, and not being sure that any threat to the officer’s bodily harm had been eliminated even after 100 rounds had been fired. In light of police violence against blacks not only within the city of Cleveland but also across the country, however, it seems that officers may not have needed a backfiring car to establish a reasonably perceived threat; rather, the blackness of Russell and Williams was threat enough. We have repeatedly been forced to accept the notion that an officer’s perception of black suspects is a justification for the use of force, even where the force is excessive and/or lethal. All the while, there is seldom, if ever, a discussion about the perception of the police in the minds of black suspects, or black people in general. It goes beyond notions of authority and speaks directly to the natural instinct of survival. What is the response to the notion that the perceived threat to life and bodily harm by police blue is a greater threat to me, an unarmed black man, during a police encounter than my blackness and suspected criminality is to a group of 13 police officers? As important to the discussion is the element of implicit bias and how that affects the way officers perceive threats. If one has predetermined that a particular group—black people—has a greater propensity toward violence and crime, and that attitude is reinforced within police culture while being excused (if not arguably condoned) by the justice system, there can hardly be any wonder that the threat of blackness is sufficient to override any factual nuances that might otherwise lead to the conviction of Brelo and other officers in his position. * Since 2005, 54 cops have been charged with fatally shooting civilians while on duty. * Of the 54 officers charged in connection with police shooting deaths, only 11 have been convicted of anything. * In those instances where officers were charged, 49 victims were black, and 43 of the officers were white. * In the past 10 years, there have been 5,236 total police shootings (includes nonfatal shootings). * Of that total, only 21 officers have been convicted. That means an officer who shoots a civilian has a 0.4 percent chance of being charged and convicted of a crime. That’s a less than half of 1 percent chance. The numbers speak for themselves as evidence of a larger problem. We don’t know, and never will find out, why Russell and Williams did not stop for police while being chased. Their names are now among a long list of those who, despite being unarmed, posed enough of a threat that a reasonable, trained, armed police officer saw fit to exert the use of lethal force against them. Once again, the threat of blackness continues to trump all. Those numbers: 137 rounds; 49 shots from one gun; two unarmed black victims dead. What is justice in 2015? Charles F. Coleman Jr. is a civil rights trial attorney, legal analyst and former Brooklyn, N.Y., prosecutor. He is also a professor of criminal justice at Berkeley College in New York. Follow him on Twitter.